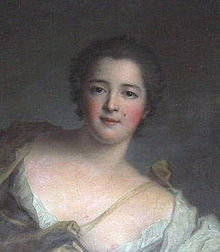 Here is Hortense-Felicité de Mailly-Nesle, known as Mademoiselle de Chalon before her marriage and the Marquise de Flavacourt after. Reputed to be the most beautiful of her sisters, her portrait perhaps doesn't do her justice, at least to our modern eyes. And her head / face look suspiciously like the portrait of her sister Diane! The portrait shows her as Venus, with Cupid sleeping (passed out?) next to her and is also by Jean Marc Nattier or his studio. 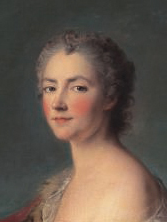 This portrait on the left is sometimes tagged as Hortense, the Marquise de Flavacourt, but you can tell by the style that this dates to a much later time, probably the 1780s, when Hortense would have been in her 70s. So despite the (fashionable) grey hair this definitely isn't her! It's perhaps her daughter, or more likely her granddaughter. Writing Hortense was fun. I really played up her virtuous and prudishly prim side: my favorite line from her is when she signs her letters: "In sainted judgement, Your sister Hortense." As we find out at the beginning of Sisters, Hortense outlived all of her sisters, and most of her generation, finally dying in 1799 at the age of 84. What an incredible life span! Think how different the world in general, and her world in particular, was from her childhood in the 1720's to her last days in the 1790's. Along with Pauline, Hortense has descendants to this day, through her 2 great-granddaughters, Elisabeth and Claire, who both make an appearance at the end of the book. Despite staying away from the King, Hortense had as much heartbreak as her other sisters - both her son and her daughter (her only children) died in their early 20s, long before she did.